Chances are when you think of Arizona, you think of saguaro cactuses, the Grand Canyon, and dry heat. And while we do have an abundance of spiny plants, rocks, and sunshine, we also have the largest contiguous ponderosa pine forest in the world. Water is life in the arid Southwest, and here in northern Arizona, our forests provide us with cool, clean water. Deer, elk, cougars, wolves, and countless creatures (including humans!) depend on forests to store, purify, and deliver water. In the 4FRI area, we’re cutting down some small diameter trees to reduce the amount of water that gets sucked up into root systems, leaving more water to move from the ground into surface streams and rivers. Wildfire is a hot topic these days, especially in the West where blazes are burning hotter and longer than ever before. The number of fires and acreage burned has been steadily increasing over the last three decades. Historically, fire has played an important role in nature, helping return nutrients to the soil and ridding forests of brushy undergrowth that blocks sunlight from reaching the forest floor. But droughts and hotter temperatures, especially in the Southwest, have turned wildfires into infernos. These unnaturally severe wildfires destroy homes and buildings, increase erosion, and harm wildlife habitat. By selectively thinning the 4FRI forests and using controlled burns, we can get rid of excessive tinder that fuels devastating fires. In 2016, the U.S. government spent nearly $2 billion of taxpayer dollars suppressing fires on federal lands — a bill that has been rising steadily since the 1980s. In Arizona, the 2011 Wallow Fire cost in excess of $80 million in fire suppression alone. The state’s Rodeo-Chediski Fire of 2002, considering property loss, fire suppression, and emergency stabilization, required upwards of $308 million. The bottom line: wildfires are expensive. Restoring our forests now is an investment that will save tax payers money in the long run. Arizona fish need clean water—something that wildfires compromise when they scorch a landscape. Large-scale fires dramatically increase the risk of flooding, both within the burn footprint and farther downstream. And big rainstorms following fires can send loads of ash, debris, mud, and silt into our creeks and streams, blanketing aquatic life and causing massive fish die-offs. Very simply, forest restoration protects fish from these threats by reducing the risk of severe fire in fish habitat. Furthermore, restoration helps revitalize understory plant life, reducing that amount of erosion and sediment moving toward streams. Not only do our forests benefit from restoration, bur our local communities do too. The Forest Service contracts with local family-owned timber companies in 4FRI to perform mechanical thinning in northern Arizona forests. In 2016, 4FRI supported nearly 1,800 jobs, all the while enhancing the aesthetic quality of ponderosa forests by returning them to their historic open character. And who doesn’t love beautiful forests? 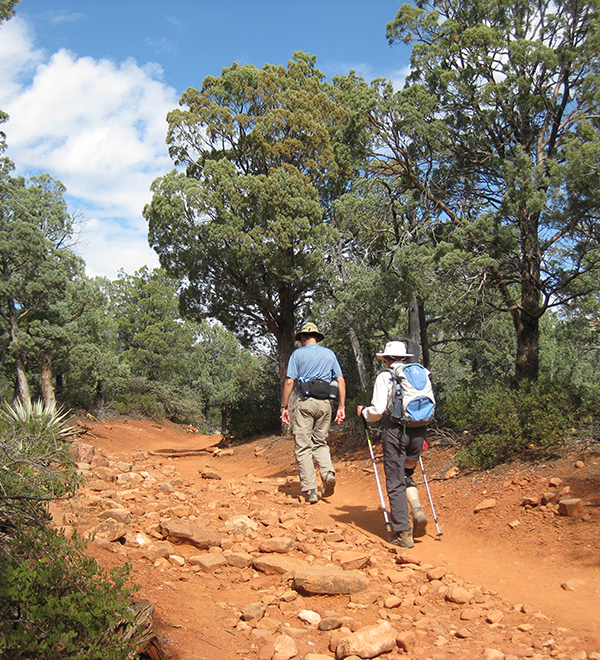 People from across the country come to the Coconino, Kaibab, Apache-Sitgreaves, and Tonto national forests to hike, camp, hunt, fish, mountain bike and more. By taking care of our forests, we’re enhancing recreation opportunities, which are another key source of jobs in the state. In fact, recreation on national forest lands supports 205,000 jobs nationwide, and as residents we know these lands play a significant role employing northern Arizonans. Healthy forests make for happy critters. Deer, squirrels, birds, and other animals remember what their old homes were like before loggers clear cut norther Arizona’s ponderosa pine forests over a century ago. Forest restoration can return the woods to something more familiar to species’ ancient memories of their habitat, where large trees thrive, the forest is more open, and low severity fire is a regular and rejuvenating occurrence. 4FRI gives everyone the unique opportunity to participate in discussions that inform the Forest Service’s approach to restoration planning. At a time when the current administration is reducing opportunities for public input on land management direction, 4FRI presents an excellent venue to demonstrate the value of widespread community participation.